The laboratory of Yeast Molecular Genetics is part of the Institute of Molecular Biology, Bulgarian Academy of Sciences. Prof. George Miloshev, PhD, is head of the laboratory. Two post-docs, one PhD student, one MSc students and two BSc student are working on several projects aiming to understand the intricate molecular mechanisms that control gene expression in eukaryotes in norm and pathology. Chromatin is a nucleoprotein complex which consists of DNA and histone proteins. The primary functions of it are 1) to package DNA into a smaller volume to fit in the cell nucleus, 2) to prevent DNA damage, and 3) to control gene expression and DNA replication. Therefore, it compacts and thus preserves the genetic material but at the same time modulates its activity by remodeling its structure and giving access of different complexes to the molecule of DNA. This dual nature makes chromatin quite dynamic and very interesting for scientists. One of our utmost interests aims to understand the fine mechanisms that underlie and direct genome activity during entire organismal lifespan, especially under optimal and different stress conditions. 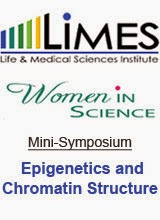 The center of scientific interest in our laboratory is set on chromatin structure and dynamics. We study the role of higher-order chromatin organization in cellular processes like ageing, tumorigenesis and development. Moreover, we are very much intrigued by the potential of different epigenetic processes to regulate and modulate genome structure and activity. Our group studies in detail the intricate interactions among histones and chromatin modifying complexes in order to draw a more precise and clearer picture of chromatin dynamics and its importance for cellular functions and the whole life of an organism. Precisely, we aim at mapping existing physical interactions among histones, particularly the linker histones and some of the constituents of chromatin remodeling complexes like INO80 and SWR1. The general idea is to shed light on the importance of these interactions for cellular decisions under UV, cold and heat shock stress conditions, during processes of normal and pathological ageing and in tumorigenesis. Scientific interests in the laboratory spread even further and target biological and socioeconomic problems like environmental pollution, the lack of adequate attitude toward food additives and genetically modified organisms brought by the sparse and often laic information circulating in the media, contemporary problems in the field of human fertility, concerns raised by the advances in recent technologies for genome editing and many others. Laboratory members are very often engaged in communication of scientific progress in the field of modern Biology, namely Biomedicine to a broader, often nonscientific audience. Georgieva, M., Staneva, D., & Miloshev, G. (2016). Epigenetic significance of chromatin organization during cellular ageing and organismal lifespan. In D. Hollar & D. Vasudevan (Eds. ), Epigenetics, the environment and children’s health across lifespans. New York: Springer; pp. 21-66. ISBN (print) 978-3-319-25323-7. Staneva, D., Georgieva, M. and Miloshev, G. (2016). Kluyveromyces lactis genome harbors a functional linker histone encoding gene, FEMS Yeast Res (2016) 16 (4): fow034 DOI: http://dx.doi.org/10.1093/femsyr/fow034. Georgieva, M., Zagorchev, P., & Miloshev G. Random, double- and single-strand DNA breaks can be differentiated in the method of Comet assay by the shape of the comet image. Electrophoresis 36 (20): 2553-2560 (2015). Georgieva, M., Moyankova, D., Djilianov, D., Uzunova, K. and Miloshev, G. Methanol extracts from the resurrection plant Haberlea rhodopensis ameliorate cellular vitality in chronologically ageing Saccharomyces cerevisiae cells. Biogerontology 16(4): 461-72 (2015). Georgieva, M., Staneva, D., Uzunova, K., Efremov, T., Balashev, K., Harata, M. & Miloshev, G. The linker histone in Saccharomyces cerevisiae interacts with actin-related protein 4 and both regulate chromatin structure and cellular morphology. Int J Biochem Cell Biol (59): 182-192 (2015). Peycheva, E., Alexandrova, R. & Miloshev, G. Application of the yeast comet assay in testing of food additives for genotoxicity. LWT - Food Science and Technology (59), Issue 1: 510-517 (2014). Miloshev, G., Peycheva, E., Dodoff, N., Kushev, D. & Lalia-Kantouri, M. Effect of light transition metal complexes of methanesulfonic acid hydrazide on the viability of yeast Saccharomyces cerevisiae. Mol Cell Probes 28(5-6): 259-63 (2014). Uzunova, K., Georgieva, M. & Miloshev, G. Saccharomyces cerevisiae linker histone - Hho1p maintains chromatin loop organization during ageing. Oxid Med Cell Longev Article number 437146 (2013). Gabrovsky, N., Georgieva, M., Laleva, M., Uzunov, K. & Miloshev, G. Histone H1.0 - a potential molecular marker with prognostic value for patients with malignant gliomas. Acta Neurochir (Wien) 155(8), 1437-1442 (2013). Staneva, D., Peycheva, E., Georgieva, M., Efremov, T. & Miloshev, G. Application of comet assay for the assessment of DNA damage caused by chemical genotoxins in the dairy yeast Kluyveromyces lactis. Antonie Van Leeuwenhoek 103(1), 143-152 (2013). Georgieva, M., Roguev, A., Balashev, K., Zlatanova, J. & Miloshev, G. Hho1p, the linker histone of Saccharomyces cerevisiae, is important for the proper chromatin organization in vivo. Biochim Biophys Acta 1819(5), 366-374 (2012). Alexandrova, R., Zhivkova, T., Alexandrov, M., Miloshev, G., Georgieva, M., Pantcheva, I. & Mitewa, M. Cytostatic and cytotoxic properties of Monensic acid and its biometal(II) complexes against human tumor / non-tumor cell lines. Central European Journal of Chemistry 10(5), 1464-1474 (2012). Georgieva, M., Staneva, D., Uzunova, K. & Miloshev, G. The deletion of the gene for the linker histone in arp 4 mutant yeast cells is not deleterious. Biotechnology & Biotechnological Equipment. 26(1) Special Edition, 134-139 (2012). Peycheva, E., Tashev, A., Vasileva, Y., Staneva, D., Georgieva, M. & Miloshev, G. Genome rearrangements in the common dandelion Taraxacum officinale web. collected from sites polluted with heavy metals. Comptes Rendus de L'Academie Bulgare des Sciences 65(6), 807-814 (2012). Georgieva, M. & Miloshev, G. The linker histone and chromatin of yeast Saccharomyces cerevisiae. In: Histones: Class, Structure and Function (ed. Chang-Hui Shen), 1-16, ISBN:978-1-62100-274-1. Nova Science Publishers, NY, USA (2011). Peycheva, E., Ivanova, E., Ivanov, S. & Miloshev, G. Improved procedure for comet assay on active photosynthetic cells from pea plants. Oxidation Communications 34(2), 320-325 (2011).